You’re already used to seeing my monthly blog income reports, so why not show you income reports on my other revenue streams? I’ve mentioned numerous times this year about how I’ve purchased two investment properties in which I hoped to generate a steady stream of income. 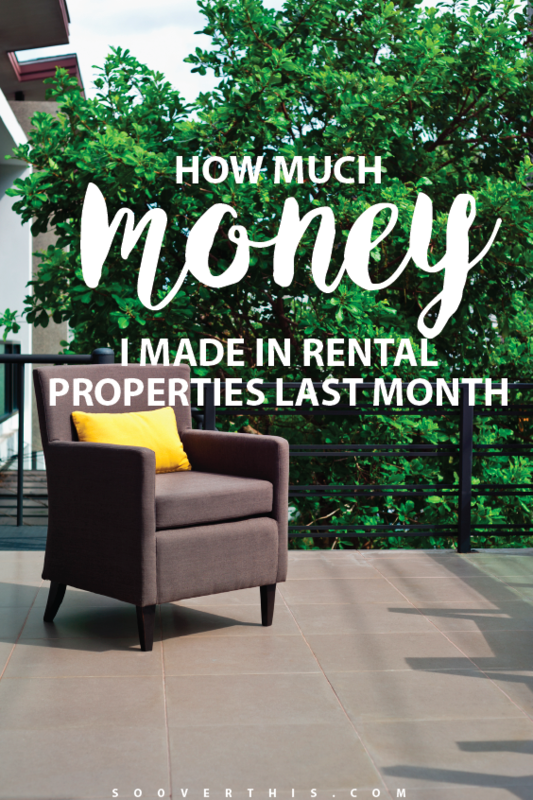 In this post I want to lay out the two rental properties I own and how I am generating income with each one, along with my future expectations. I bought a condo as my first property investment. I hear a lot of adverse things about condo’s, like noisy neighbors, less annual appreciation because you don’t own the land, and then those pesky monthly fees that are owed to the association for upkeep and what not. What they fail to mention is that for a nominal fee you don’t have to worry about the entire exterior of your unit. Unlike a house, you don’t need to maintain a lawn, shovel snow, repair or replace the roof, or even fix the outside deck or patio. For someone who plans on renting out their place a condo is an ideal home type for alleviating stress and worries. Nobody is going to take care of your place as well as you do, after all, they are only living there temporarily. For a mere $175 per month, which I roll into the rental payment, I don’t have to worry about the tenants keeping up with the exterior of my place. This property is located within a half mile of a popular downtown area, and commands a good rental price for a condo that is only 900 square feet and 2 bedrooms and 1 bathroom. People in Michigan are so used to driving in traffic they love the opportunity to walk places without hopping into a car. 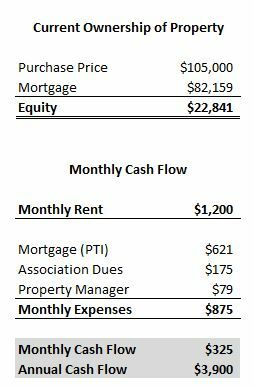 So without further delay, please see the breakdown of my current equity positions, as well as monthly & annual cash flow from the property. With that sort of cash flow I want to own 10 more of these, and I am constantly looking believe me! I have been a bit more discreet about this property because the whole process of shopping around and closing on it took quite a bit of time, and I have a partner involved in the purchase of this property. A friend and I opened an LLC and purchased a condo in sunny Florida, right off the Gulf of Mexico. The LLC is because we plan on renting this condo out and perhaps buying up more condos and/or homes in the near future. Unlike the condo mentioned above, this one was bought with a partner, trusts and LLC’s were established, and the property was out of state…the whole process couldn’t have been any more complicated. But I am proud to say we closed on this last month and are having some minor repairs and updates done so we can start renting this out come November! The Florida market, specifically around the Siesta Key area, is red hot right now when it comes to rentals. The best part is that while properties certainly aren’t cheap down there, they are still surprisingly well below the pre-meltdown days…I’m not entirely sure why, but I’m happy to get into a market that still has a long way to go regarding appreciation. 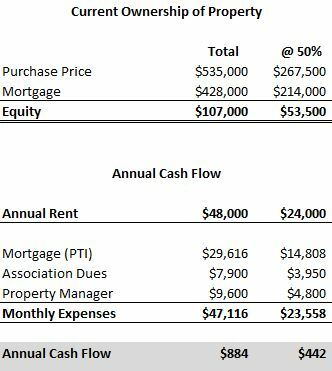 Unfortunately, because I have no actual rental information to provide to you right now, I can only give you my current equity position and a breakdown of the estimated cash flows that I for see for the coming years. Please see that details below. This breakdown is quite a bit different from my local rental. First and foremost, you will notice I have a column that calculates everything at 50%. That is because my partner and I split the equity, rent, and costs all down the middle evenly, which passes through our LLC and then any income leftover at the end of the year is distributed equally to us both. The equity we have is simply the 20% we put down to obtain the mortgage. Because rent fluctuates and is very seasonal, it didn’t make sense to show you a monthly rental rate. Our annual rental rate is based on actual 2015 rental income for the unit next door to ours, which is managed by the same property management company. This company takes 20% off gross revenue, which is pretty common for that area, and they are well equipped to maximize our income on this unit. Now you may be asking yourselves why I would go through all this trouble to net less than $500 in cash over an entire year. Well, there are several reasons actually. First, let’s not forget about our ability to write-off depreciation every year. Depreciation isn’t a real cash use, but the IRS allows us to to write it off like it’s an expense, which means we get to keep more of the income we earn at the end of the year. So in a sense, I will net much more than that $442 I show you above. Second, I get to use the property two weeks out of the year, each and every year. That’s a free place to stay on the beach in a fun touristy area. There is an opportunity cost avoided if I vacation here each year. Don’t forget that I do have work to do on certain things for the condo while I’m down there, so many different expenses can be written off while traveling there. Lastly, I will get my mortgage paid for, and watch my equity and capital appreciation build up on this condo without costing me a dime. In fact, I see the benefits of owning rental condos in this area and I want to buy more of them! I should probably wait and see how this one works out first. I will keep all of you updated on my progress with the rented condo, newly acquired condo, and any future rentals I should end up purchasing. I used to scoff at rental properties considering I’ve always been a fan of the aristocratic dividend stocks that pay out a nice steady return each year. 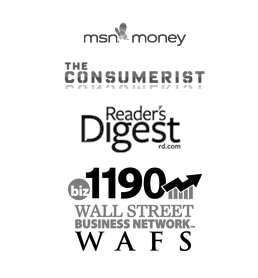 However, I’ve come to appreciate income and investment diversification more and more throughout the years.